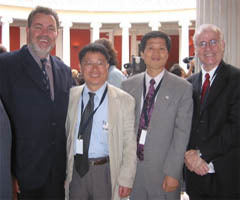 Lee Sang-ki (second from left), president of the Journalists Association of Korea (JAK), poses with Christopher Warren (first from left), president of the International Federation of Journalists (IFJ), Kang Seok-jae (second from right), chairman of the JAK's International Affairs Committee, and Aidan White, general secretary of the IFJ, during the opening ceremony of the 25th IFJ World Congress in Athens May 25, 2004. The Journalists Association of Korea (JAK) has agreed in principle with its Greek and Russian counterparts to launch cooperative exchange programs starting next year. The JAK have also agreed with Bulgaria on bilateral journalists exchange and cooperation programs. In a meeting with Vsevolod Bogdanov, chairman of the Russian Union of Journalists, May 28, 2004 at the Divani Caravel Hotel in Athens, Greece, Lee Sang-ki, president of the JAK, agreed on the exchange programs. 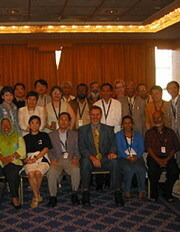 They were attending the 25th World Congress of the International Federation of Journalists (IFJ). Under the theme "Journalism on the Move: Building Solidarity to Meet Global Challenge," the week-long Athens IFJ meeting, which kicked off May 25, drew about 250 delegates from 105 countries. The following day at the same hotel, Lee met with Manolis Mathioudakis, president of the Journalists' Union of the Athens Daily Newspapers, to agree on the regular journalists exchange programs. "With the agreements, Korean journalists are likely to have more contacts with journalists in Russia and neighboring countries," Lee said, adding that the regular journalists exchanges would greatly help contribute to peace in East Asia. The JAK has maintained regular journalists exchange programs with China, Vietnam and the United States. Under the agreement, Lee said, a delegation of about 10 Korean journalists would visit Russia and Greece, respectively, as early as next year, on a reciprocal basis. The JAK, Korea's largest body of working journalists, plans to invite some Russian and Greek journalists to the 2nd East Asia Journalists Forum scheduled for late October in Korea. The JAK launched the annual forum last October in Seoul, the first of its kind involving Northeast and Southeast Asia, drawing about 40 journalists from 14 countries, including observer nations like the United States, Australia and Germany. On April 28 this year, a similar agreement was made at the JAK office in Seoul between JAK President Lee and Valery Agarkov, deputy editor-in-chief of the Foreign Policy Department of the Russian news agency ITAR-Tass. Dozens of journalists from the Asia-Pacific region pose during the regional meeting of the 25th IFJ World Congress in Athens, Greece on May 27. At the meeting, the participants agreed to expand journalists networking through the Journalists Association of Korea-initiated East Asia Journalists Forum. As recently as June 10, Lee also made a cooperative journalists exchange agreement at his office in Seoul with Maxim Minchev, director general of the Bulgarian News Agency (BTA). BTA is Bulgaria's national news agency established on a decree by Prince Ferdinand I in 1898. Its operation is regulated by a statute adopted by the 36th National Assembly on June 29, 1994. The agency is an autonomous national news organization, whose director general is elected by the Parliament. Meanwhile the JAK plans to invite several journalists who attended the Athens IFJ Congress as observers or panelists for the 2nd East Asia Journalists Forum. The JAK tentatively set the dates for the annual forum Oct. 27-Nov. 1 in Seoul and Jeju. "As part of our efforts to expand international exchange programs, we will bring as many IFJ delegates as possible to the forthcoming forum, thereby making it a genuine regional gathering for journalists both in East Asia and the rest of the world," Lee said. In recognition of the importance of the launch of the forum, the IFJ, headed by Australian Christopher Warren, nominated Kang Seok-jae, chairman of the International Affairs Committee of the JAK, as the IFJ's Asia coordinator at the end of the Athens IFJ Congress. In IFJ Asia's monthly e-bulletin dated June 4, it said Kang was nominated to be a contact point for improved regional networking.